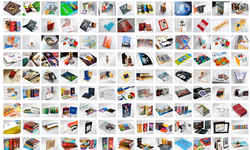 Manufacturing and Trading of Product Catalog Printing, Brochure Printing, Corporate Diary Printing, Book Printing, Brand Promotion Items Printing and Printing Box etc. Established in the year 2004, at Ahmedabad (Gujarat, India), we, “Shreedhar Printers Pvt. Ltd.”, are a professionally managed organization, engaged in providing a wide range of Product Catalog Printing, Brochure Printing, Corporate Diary Printing, Book Printing, Brand Promotion Items Printing and Printing Box. The extensive industry experience consistently guides us to meet our varied business requirements and ensuring our product superiority in the domestic markets. We create cost effective marketing and design solutions without sacrificing the creative process. We keep your budget intact and your project on track. Add to the mix a strong focus on service and creativity. We bring your ideas to life and keep them breathing. Our expertise also lies in providing a variety of Offset Printing Services Solutions to our customers. By offering these services we also offer customization in our services according to the specifications of our clients. The services provided by us, are acclaimed as we follow transparency in all our business dealings and work with a customer centric approach. We are assisted by a team of expert professionals, who further enable us to offer other world class services. Our professionals assist us in rendering these services and ensure to accomplish the projects within given time frame without compromising the quality. We have latest digital printing machines to ensure services at par with international quality standards. Our organization is backed by the team of highly experienced and creative professionals. These professionals help us in accomplishing all the business related operations efficiently and effectively with the help of advance tools, machines and printing techniques. Our appointed professionals have the vast industry experience and are familiar with the activities involved in the industry. Moreover, creativity, excellent print quality, clear communication and timely execution of our services have made us a reliable name in the market. Hence, owing to all these attributes, we have garnered praise from all quarters of the industry. Our organization was founded by our mentor, “Mr. Minesh Patel (Director)”, who has become the driving force behind our success. He has a rich experience in this industry, due to which, he has been consistently guiding us throughout our business operations. 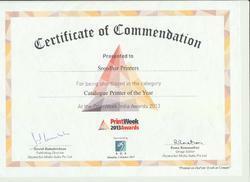 Catalogue Printers Of the Year At the Print Week India Awards 2013. We have a diligent and dynamic team, which is the most precious asset of our organization. In our team, we have creative graphic designers, quality controllers, technicians, machine operators and industry experts, who have rich experience in their respective field of operation. These professionals are well-versed with the use of latest software and machinery. Their innovative ideas enable us to provide clients with unique printing solutions. Regular training sessions are also conducted to nurture and polish the skills of our professionals. Shreedhar Printers is a multi-color, offset printing unit with best-in-class printing solutions sufficing all your needs. Promoted by industry professionals with more than a decade of business experience Shreedhar is poised to give the end to end publishing solutions. Shreedhar is a sister concern of Shivkrupa Printers – a renowned name with esteemed and top-notch clientele having the track record of executing successful jobs satisfactorily. Shivkrupa Group is a reputed name in high-caliber bookmaker and binder and by joining hands with together they deliver amazing and outstanding publishing solutions. Established in 1990, the group has been delivering the most successful and client-centric high-quality commercial printing solutions to both domestic and international clients. From the beginning of the project till its completion, rather than just being a vendor, Shreedhar acts as consultant and partner offering impactful and cost-effective solutions thus form an everlasting association with the client. Having cutting-edge technology and infrastructure as the backup, the strength of the company lies in the professional team and precision led processes. Together it forms an enviable team offering the complete gamut of commercial printing services from prepress, printing, finishing and binding. Be with Shreedhar & Shivkrupa and be assured of the meticulous and comprehensive printing and publishing solutions. We dedicate our process, practice, and performance to the mission of constant upgradation. We dedicate ourselves to follow the quality at every step. We dedicate ourselves to the highest customer satisfaction. We dedicate ourselves to unparalleled excellence. To lead the industry with innovation, advancement, and quality. With 4 color UV process, we are capable of printing 4 colors on non absorbent substrates like metallic polyester films like PVC and metallic papers without any additional time for drying. This technique is used to reproduce metallic effects by printing 4 colour on spot foiled areas. This is used for metallic objects. FM Screening is a screening process without screen angles unlike conventional screening which leads to "Moire" patterns. This gives fragrant effect to the printing. With spot and full coating one can have any kind of fragrance on the paper. This type of printing is done by using special lenses and it gives 3 Dimensional printing effects and creates more live pictures. If you want embossed printing solution, the contour embossing is used wherein three dimensional dyes are used to emboss the paper. This type of printing is used to bring out finest embossing details on the paper.